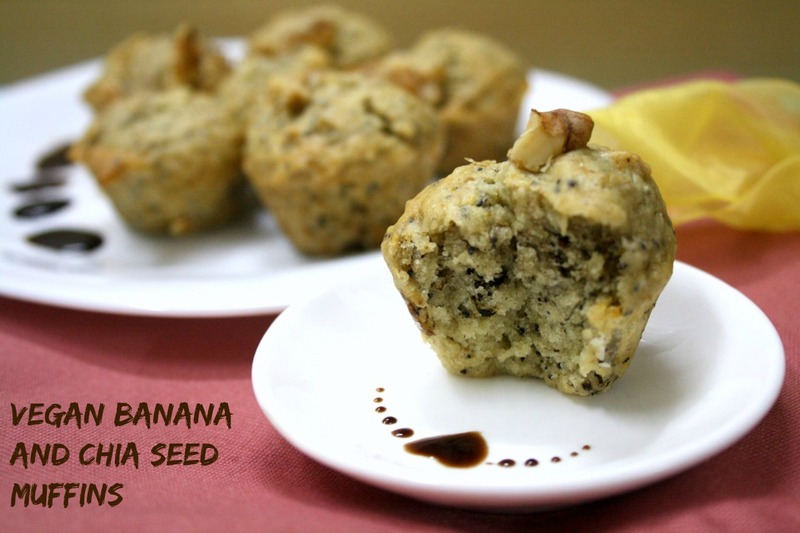 For the second day of making Anti Inflammatory Diet, I opted to make a muffin with Banana, Walnut and Chia Seeds. I remember somebody had gifted us with Chia seeds, I realized it was Priya Srinivasan. And then in another meet, Priya Suresh gave us Black Poppy Seeds. I saw one packet tiny black seeds and assumed it to be chia seeds and even confirmed with my friends. I tried looking at the net for pictures. Both looked same from far. Anyway I baked this delicious muffin and was happy with the results. Only thing left to confirm is to soak the seeds and see if it blots up or not. I would suggest you try these for a breakfast and feel happy indulging in a mildly sweet good filling muffin. I was only able to click the step by step, and yes that cute heart and final clicks are Konda’s handiwork! 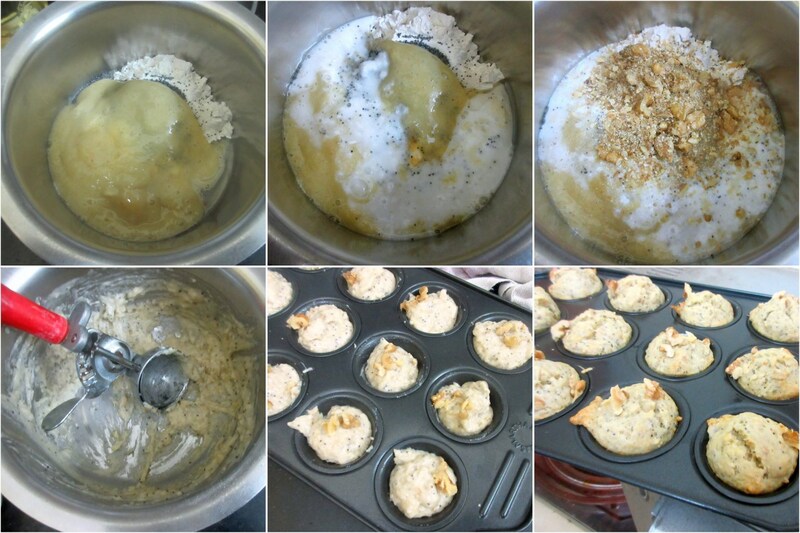 Grease and dust a 12 cup muffin pan or use paper liners. In a bowl, mix the egg replacer with water and keep it aside. In a bowl add the flour, sugar, Oil, Chia seeds, walnut pieces along with flour. Mix well. Then add the baking powder, baking soda, Banana puree. egg replacer. Mix everything with a spatula. 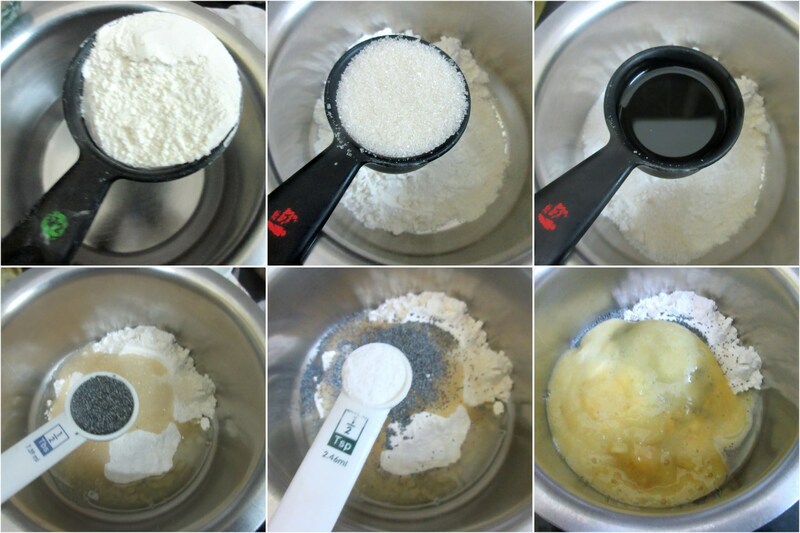 The liquid should be enough to get the batter, if required add a tsp of water. Using a mini ice cream scoop, fill the molds. Top with walnut. Bake for 15 or until a skewer inserted in the muffins comes out clean. The original recipe calls for 1 & 2/3 cup of flour. I halved the recipe, so I used 1/2 cup flour + 5 tbsp + 1 tsp flour. That is a nice setup. 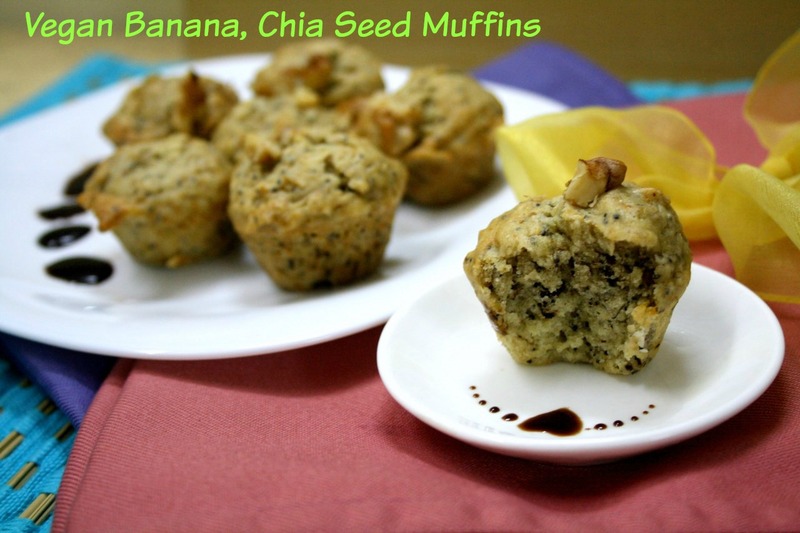 These chia muffins would be a nice way to start the day. I haven't used chia seeds inbakes , must try them . The muffins sounds healthy and great work by Konda..
Ahh I love that heart valli. Did she made it free hand?! Oops sorry the muffins look great, love to have them anytime!!! love the addition of chia seeds. Great way to incorporate them. Thanks for sharing this post as I am looking a nutritious healthy but an eggless dish from a long time.I will try it in the near future definitely. Gaurav Sharma Please do try.. I am thinking of using chia for pudding but haven't done it yet. 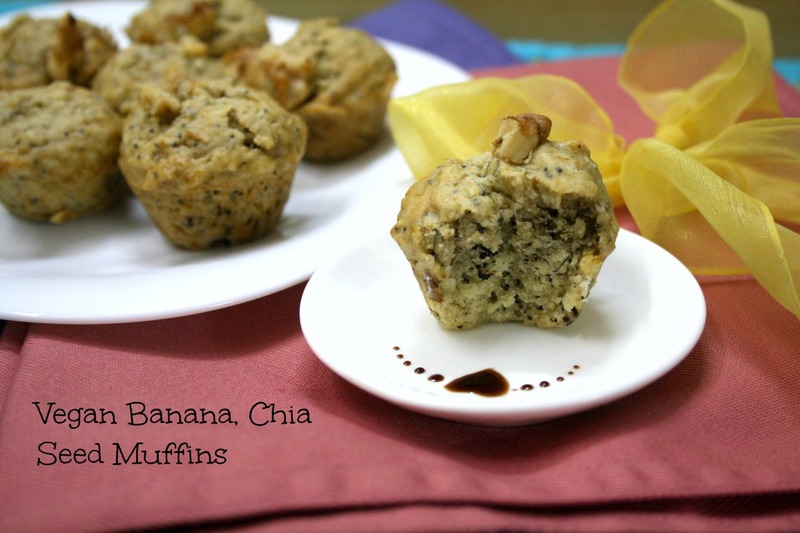 Muffins with chia seeds look so lovely. The muffin texture has turned out great and love the presentation with chocolate sauce. Valli, those muffins look amazing and the heart deco on the plate looks sooo beautiful. I've used chia seeds in pudding and im yet to use it in baking…after seeing your muffins I'm getting myself ready to bake…nice one Valli! I have never thought of using chia seeds in baking! The muffins have come out really well. 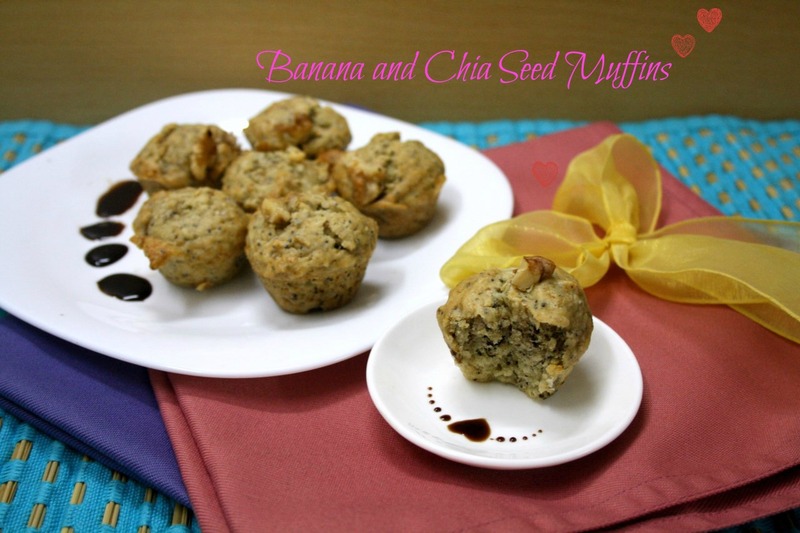 Addition of chia seeds sounds super interesting, well done Valli.. Again those muffins looks fabulous. Muffins looks so perfect and healthy too. Lovely addition of chia seeds!